My name is Kay Petal and I Felt Alive. I’ve been needle felting since 2007. I discovered it by chance on the internet while searching for crafty things to do with old wool sweaters. After my great discovery, I never really got back to my sweaters – needle felting sort of took over my life. I’m a lifelong Alaskan but most recently I can be found in the beautiful Pacific Northwest in the little town of Cave Junction, Oregon just a few minutes north of the California border. I grew up in a small Alaskan town in a large, artistic family. I was the crafty sister with stacks of craft magazines in my room at a young age. I dreamed of one day being one of those amazing crafters that inspire others to try something new. Some of my earliest needle felted dolls were recognized with honors in the Alaska State Fair with my rendition of Albert Einstein winning Best in Show. That was unbelievable since I had only started felting earlier that year. You see, I never knew I was artistic until I discovered needle felting. Just after my dolls’ big debut at the Alaska State Fair, I discovered my needle felting idol, Birgitte Krag Hansen, was traveling from Denmark to Alaska to teach. I found out only a couple of weeks before her arrival and was relieved to find a workshop with an opening. I soon found myself deeply immersed in the most amazing weekend of needle felting I could have imagined. I learned so many of the techniques I use today but most of all I learned how to keep the wool alive. I always say that Birgitte must have touched me with a magic wand that weekend because my needle felting rather took on a life of it’s own and blossomed into Felt Alive. At the end of the workshop, Birgitte asked us to make a promise to always do good needle felting and always teach good needle felting. I think of that often as I explore this craft and share it with the world. It is important to me that my students grasp the fundamentals of needle felting and discover the magic that I learned that weekend. Needle Felted wool dolls are the most unusual dolls I have ever seen – I have a lifetime worth of projects in my head. I truly believe I found my “thing” in needle felting. Needle felting found me at a crucial time in my life. Just after I turned 40 I lost my Dad to cancer while facing down the beast myself. I was diagnosed with a rare salivary gland cancer while my dad was losing his battle with prostate cancer. It was after Dad died and during my recovery from my VERY successful treatment that I found myself searching for something more to do with my life. I had no idea I would find it in such a humble thing as making dolls out of wool from sheep. During my health crisis I realized how much I rely on my sense of humor and with needle felting I’m finding the same to be true. My sense of humor drives my creativity and each new piece strangely becomes like family. I tend to keep most of my work in my own collection and enjoy the creative freedom in that. I am finding my specialty is in caricature art dolls. I just can’t get enough of bringing a real person to life in wool. Another gift that needle felting has given me is that I have discovered I have a natural talent for teaching. Besides teaching locally, I have also produced many hours of video tutorials to teach the whole world the magic of bringing wool to life with a simple felting needle. If needle felting can help anyone else as much as it has helped me, it is my duty and obligation to share my love far and wide. My husband, Ethan, and I have been married since 1985. 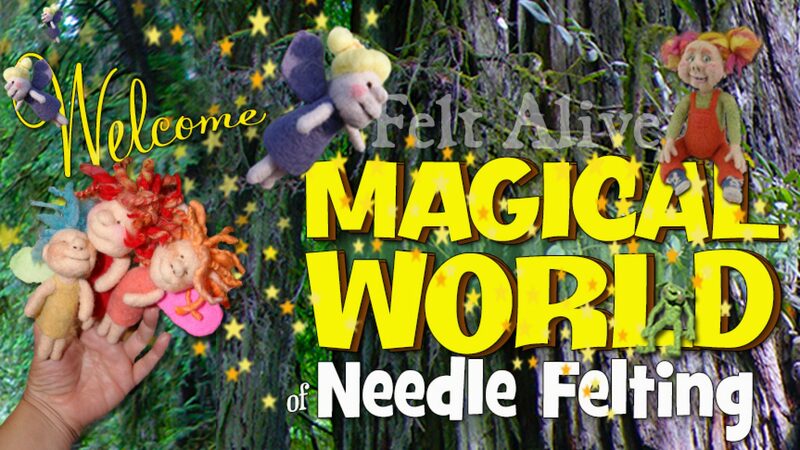 Besides editing and producing all of my video tutorials, he has been instrumental in developing our amazing Felt Alive Color-Coded Felting Needles and is in charge of production. My home studio is open for classes and you are sure to meet Ethan while you are here. Thank you for your videos. That is how I have learned to felt. You are a great teacher.